June 2011: Swampy was a single egg in a forest swamp. Amy took a tumble into the swamp during the collection process, and hence the name! The egg was exceptionally long and slender too. Swampy is a very courageous bird with aspirations of leadership of the C-Block birds. She can run fast too and gets away from confrontations with speed. August 2011: Swampy is one of the smaller cranes in the group. She likes to hang out with Mildred. For a small crane she is getting very confident in flight. On Sunday 28th August, Swampy was found injured within the release enclosure - and we presume she had flown into the fence. 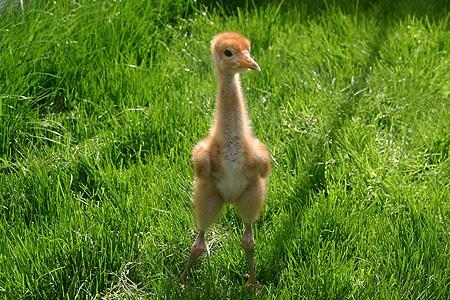 She is currently undergoing treatment in our purpose built crane recuperation unit in Somerset, and we hope to release her back with the other birds shortly. October 2011: After four long weeks in recuperation, Swampy was well enough to release and was put back out into the release enclosure on the last day of September. One week on, she is still not back with the other birds, but is well, and flying in and out of the enclosure. Fingers crossed for a full reintegration soon! 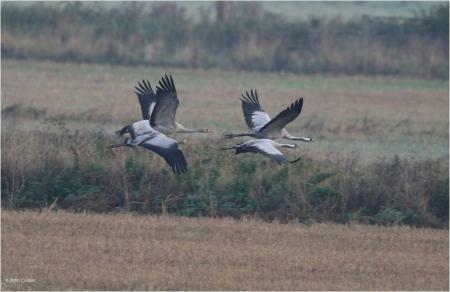 Mid October 2011: Swampy is now foraging, flying and roosting with the rest of the cranes. Although still slightly weaker than the others, keeping to the back of the group in flight, she is once again a part of the flock. May 2012: After a period of not being able to locate Swampy, her radio signal was picked up from an area next to a new fox earth, so she was temporarily presumed dead. Closer inspection with a metal detector, however, revealed that her radio tag had simply fallen off in that spot, and she turned up with the rest of the birds a few days later. Phew! September 2012: Swampy has adapted well to life with the Somerset flock and she and her cohort are all behaving as naturally as any wild cranes. They have spent the summer feeding on the unseasonally flooded grasslands of the Moors and Levels in small fragmented groups, but as autumn rolls in they are starting to flock again and follow the harvest, hoovering up any spilt and wasted grain in arable fields. January 2014: 2013 was largely uneventful for Swampy, spending the spring and summer on Aller Moor and West Sedgemoor and the winter very much as part of a tight-knit flock on Stanmoor, near Stoke-St.Gregory. 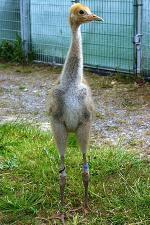 We hope that she will pair up this year, although at 3 years old she is still very young to make a breeding attempt. July 2015: Swampy paired up with Mennis, a 2010 male in spring 2014 and the pair were seen on Wetmoor, and also on Kingsmoor near Illchester and looked to be prospecting for a nest site. However, they both went off the radar in May 2014 – and Swampy was missing for six months and we were beginning to assume that she had been lost or died. However in late autumn 2014 we heard from a local farmer that a pair of cranes had been on land on Kingsmoor all summer. It is highly likely that Swampy was moulting there. The winter of 2014/15 was spent with the main flock in Somerset and in spring 2015 after going awol again, Swampy was identified along with Alexander, raising two young newly hatched chicks in Kingsmoor. The pair raised the two chicks to successfully fledge in July 2015 – the first fledged chicks in Somerset ! February 2016: Swampy remained with Alexander and their two chicks on the Somerset levels all winter. They were recorded back near their breeding area - still joined with their two chicks - in early February. At some point they will have to chase their chicks away in readiness for another breeding attempt. July 16: Returned to last year’s territory on Kingsmoor in Somerset. The pair were seen there with their first year young in February though the youngsters soon left . 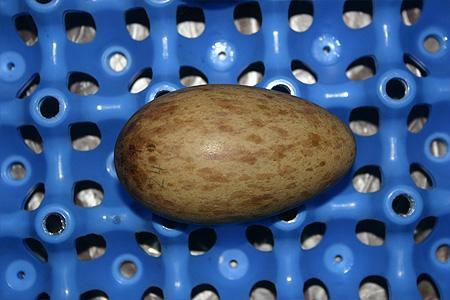 The 1 st Incubation started around the end of April but failed due to a cause unknown. Incubation on the 2 nd nest in a Ryegrass field failed after 12 days, cause unknown. The 3rd incubation started around the end of May and went full term. One chick is known to survive. Sep 16: Alexander and Swampy fledged the chick in early September. The chick was caught and colour ringed in late August (Red-White-Green). Fanstastic work for this pair - the most productive pair of all the cranes ... so far! Oct 16: Sadly, the body of Swampy was found by a farmer in a maize field in late September, and we sent it for post mortem. Post mortem showed the presence of embedded gun shot, indicating that the most likely cause of death was shooting. This was reported to the police and is currently being investigated, as the shooting of a crane is a wildlife crime in the UK - they are not quarry species, and can not be legally killed.